The Florida scrub lizard (Sceloporus woodi) is restricted to isolated sand scrub habitats in peninsular Florida. Tiger beetles were not the only rare endemic species that I encountered during my visit to the Lake Wales Ridge in central Florida last August. I didn’t know what this small lizard was as I watched it bolt from the trail and scamper for cover during my approach; however, having already found two endemic tiger beetles, I had a feeling that this lizard might also be a good one. The photo shown here is admittedly not one of my best, but it was the only one I managed to get before the lizard ducked into the brush for good. Horribly overexposed, I did what I could with it in Photoshop to make it halfway presentable, but there is no question that its subject represents a Florida scrub lizard, Sceloporus woodi¹. This small, diurnal, ground-dwelling lizard belongs to the family Phrynosomatidae (same family as the Texas horned lizard that I featured in this post) and is restricted to Florida’s rare sand scrub and sandhill habitats. Like the recently featured Highlands Tiger Beetle, this species is threatened by the isolated, disjunct nature of its required habitat—a threat made worse by the ever increasing pressures of agricultural conversion and urban development. ¹ Sceloporus is derived from the Greek word scelos meaning “leg” and the Latin word porus meaning “hole”, referring to the pronounced femoral pores found in this genus of lizards. The species epithet honors Nelson R. Wood, a taxidermist at the U.S. National Museum who collected the type specimen in 1912. 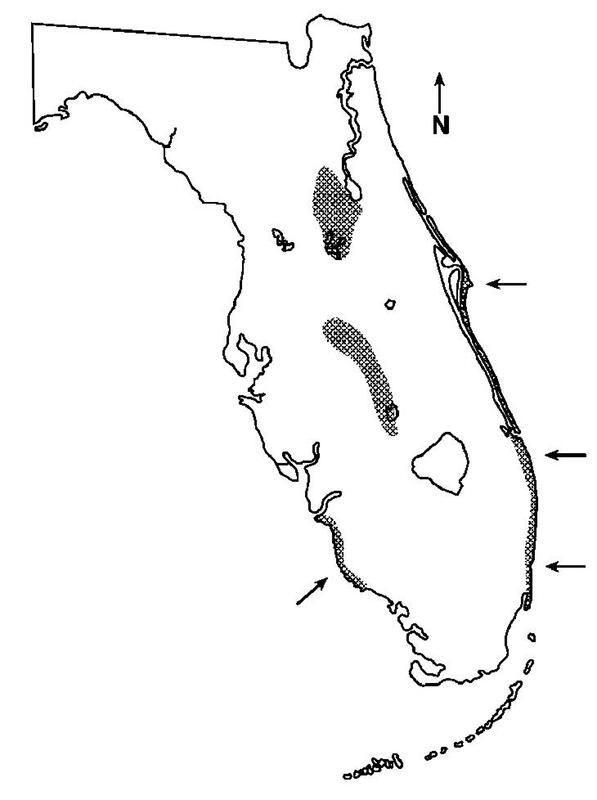 Distribution of the Florida scrub lizard (from Branch et al. 2003). The Florida scrub lizard is related to and closely resembles the much more common and widely distributed southern fence lizard (Sceloporus undatus), which co-occurs with the scrub lizard in northern Florida. Fence lizards, however, lack the dark brown lateral stripe that is clearly visible in the above photo, a feature seen in juveniles and adults of both sexes of the scrub lizard. Juvenile and adult female scrub lizards also exhibit a dorsal zigzag pattern; however, this fades in males as they reach adulthood and develop the characteristic bright blue belly patches that are seen in both this species and in the fence lizard (Branch and Hokit 2000). Since light blue patches are just visible on the belly and throat of the individual in the photograph, I haven’t been able to determine whether it represents a mature female or a still-juvenile male—any help from a knowledgeable reader would be greatly appreciated. Unlike the fence lizard, the scrub lizard displays a high degree of habitat specificity, occurring as disjunct populations in strict association with the major sand scrub ridges of Florida. The healthiest populations are found on the Mt. 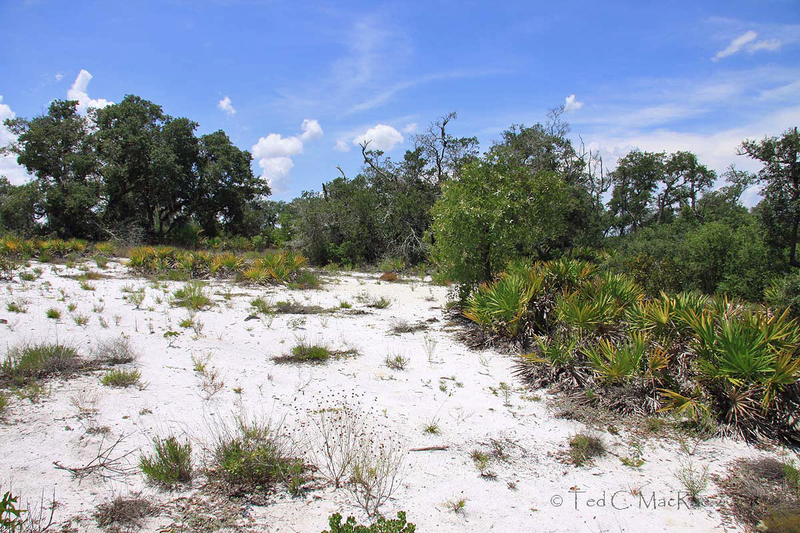 Dora Ridge in northern peninsular Florida, on which significant remnants of scrub habitat are preserved in the Ocala National Forest. Populations also occur on the Lake Wales Ridge of central Florida and the Atlantic Coastal Ridge, but the status of these populations is less secure. Populations also once occurred along the southwestern coast on the Gulf Coast Ridge, but these populations are now believed extirpated as a result of urban development (Jackson 1973, Enge et al. 1986). 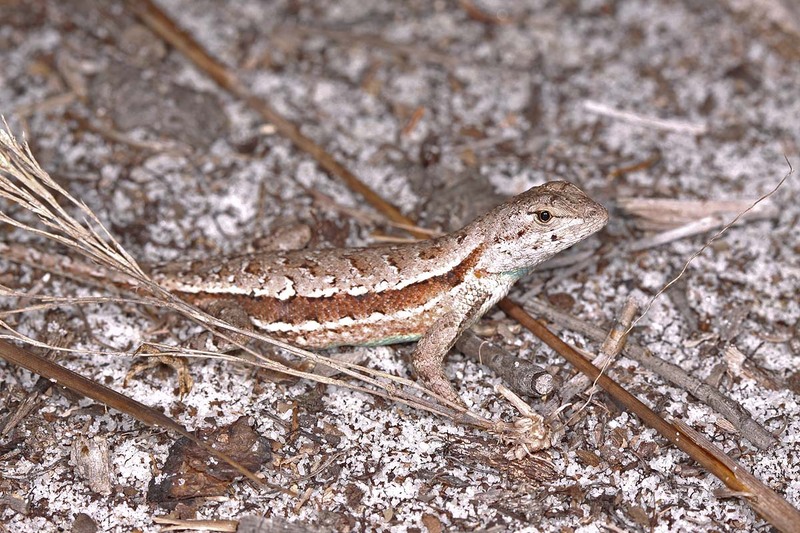 While the Florida scrub lizard is not listed as a threatened or endangered species at the state or federal level, its high specificity to an increasingly isolated and fragmented habitat and its apparently low dispersal capabilities are clear causes for concern over its long-term prospects. As remnant habitats continue to shrink and become more isolated, the threat of localized extinction becomes an increasing concern for the lizard populations that they support. Scrub lizard habitat is threatened by development, fragmentation and increased vegetation. The precarious status of scrub lizards and their occurrence in several disjunct, isolated populations makes them interesting subjects for genetic studies. Mitochondrial DNA analyses suggest that scrub lizard populations exhibit a high degree of phylogeographical structure, with populations diverging significantly not only between major scrub ridges, but also within them (Branch et al. 2003). The findings support the notion of long-term isolation of scrub lizard populations on the major scrub ridges and confirm their low dispersal rates among adjacent scrub habitats within ridges (as little as a few hundred yards of “hostile” habitat may be sufficient to prevent movement to adjacent habitats). More significantly, the results support the concept of two distinct morphotypes on the Mt. Dora and Lake Wales Ridges and also raise the possibility that Atlantic Coastal Ridge populations represent a distinct evolutionary entity as well. These findings are consistent with the hypothesis that scrub lizards evolved in central Florida, where they were isolated when surrounding lands were inundated by rising sea levels during the late Pliocene and subsequent interglacial periods during the Pleistocene. During periods of low sea level they dispersed to the younger Atlantic and Gulf Coastal Ridges, where they were isolated from parent populations when more mesic conditions returned during the Holocene (12 kya to present). The genetic distinctiveness of these different ridge populations may justify qualifying each of them for protection as “significant evolutionary units” under the U.S. Endangered Species Act, since it raises concerns about the use of translocations, a common strategy for establishing new populations in restored habitat or augmenting existing populations, as a conservation strategy for the species as a whole. Since lizards located on different ridges are more divergent than lizards from populations located on the same ridge, movement of lizards between ridges could compromise the integrity of the genetic differences that have accumulated over millions of years and result in loss of genetic diversity. As a result, augmenting populations on the Lake Wales and Atlantic Coast Ridges with lizards from robust populations on the Mt. Dora Ridge may not be desirable. Instead, it may be necessary to protect individual scrub lizard populations on each of the major scrub ridges in order to preserve as much of their genetic diversity as possible. This entry was posted in Reptilia and tagged conservation, Florida, habitat management, herpetology, lizards, nature, reptiles, scrub, taxonomy. Bookmark the permalink. Are fence lizards those big fat ones with the spines on their back? No, those are horned lizards. Fence lizards would look very much like the photo above but not have the dark lateral stripe. I guess I’m not being specific enough. What I’m thinking of is definatly not a horned lizard. It is grey-colored, about a foot long, has a curly tail, and is found is southwestern florida. Any ideas? Hard to say, but it’s probably one of the more than 3 dozen introduced lizard species present in Florida (compared to only 16 native species). Scales along the back and fat makes me think of the iguana, but these can get quite large (up to 6 feet in length). I’m not sure what else it might be. Ooh – how about this one: northern curly-tailed lizard? That might be it. Thanks. Great post, Ted; full of fantastic natural history information and science-based conservation issues. I have always enjoyed fence lizards here in Missouri and will do so even more knowing about their specialist cousins in Florida. Hi, Justin – thank you. I’ll enjoy their Missouri cousins with a little more appreciation as well. Marvelous little critter! I think some of its cousins live here in Texas, but I don’t think we have anything quite like it. Close, maybe, but not quite. How delightful! You have a knack for suffering the elements long enough to find beauty that’s hard to find elsewhere. Thank you! Thanks, Jason – I don’t know if it’s a knack or stubbornness. Either way the result is the same – getting to see something that few others ever see. Like you, I treasure the diversity of life that is to be found out there. However, despite the best efforts of you and I and the many other like-minded people who are working feverishly to prevent it, I fear that in the end we’re just simply chronicaling the extinction and having little long-term impact on reducing its pace. I’m not normally such a fatalist, but in this regard I’ve not seem much reason for optimism. What that means for us as a species in the next 50 to 100 years is a little uncomfortable to contemplate. I’m glad you think the photo is fine. I’m really my own worst critic – perfectionist tendencies permeate most facets of my life. Amusingly, I also had my first few photos published last year, all of which were taken with the point-and-shoot that eventually got me interested in photography on a more serious level. I’m still waiting to publish a photo taken with my dSLR! Nice portrait of a lizard, Ted. Jason, lizards of the Sceloporus genus are found pretty much coast to coast, often called spiny lizards or, as Ted noted, fence lizards. We have fence lizards up here (I live in SE Pennsylvania) – more in sandy habitat in NJ than in PA, but I’ve seen them on wooded hillsides in SE Ohio too. Hi Ted – what an education! I feel very scholarly now, and have learned about a reptile species that I previously had not known. Thanks for presenting this great info. Great post! Thanks, Amber! Glad you liked it. Ted: I grew up in central Florida and we often thought of those sandy ridges as waste places. As a young adult, I started wandering about on my own and fell in love with Florida’s springs and piney flatwoods. Your blog shows the hidden uniqueness of these places. I just finished reading Ecology of a Cracker Childhood by Janisse Ray and it reminded me of the subtle beauty of the lands that hid the Seminoles. Thanks for your excellent description of the variations among these tough lizard populations. Hi Cindy – thanks for your kind comments and your insight. As a seasoned naturalist, I’m finding it easier and easier to fall in love with habitats that in my youth I wouldn’t have given a second look. I look forward to my next change to explore the Lake Wales Ridge – what a fantastically unique place.